2018 was another great year for Outer Reaches. See Photos of Day 1 and Day 2 of Outer Reaches 2018. A big thanks to I Love KC Music for the photography and edits. KANSAS CITY, MO. 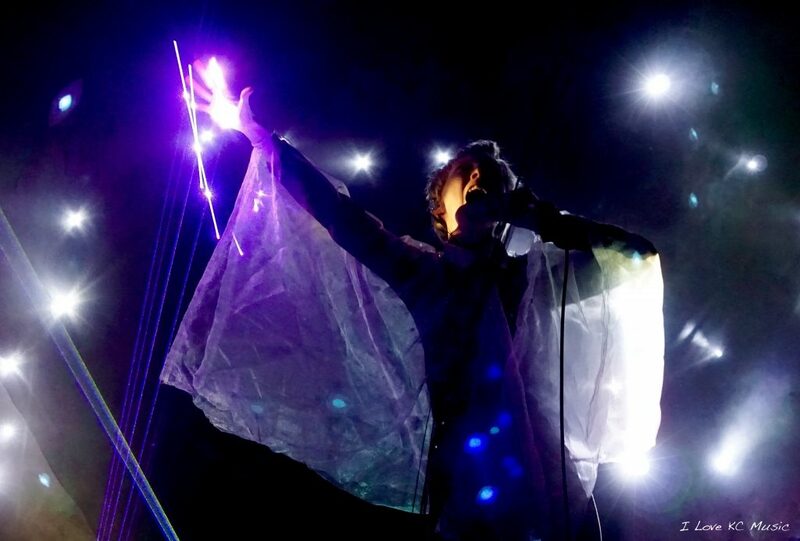 – The organizers of Outer Reaches, an annual live music festival in its seventh year, have announced official dates and the first round of artists for their upcoming two-night event. 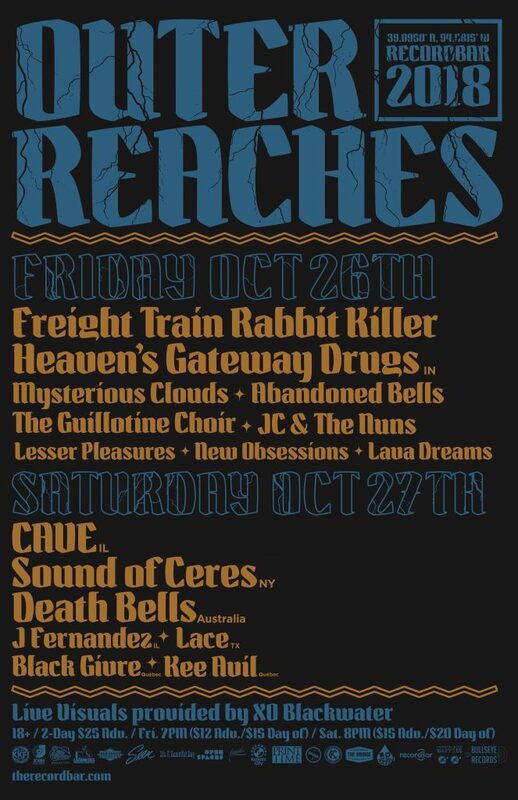 The weekend before Halloween, Friday, October 26 and Saturday, October 27, 2018, the festival Outer Reaches will haunt the crowds at recordBar (1520 Grand Avenue) in Kansas City, Missouri. 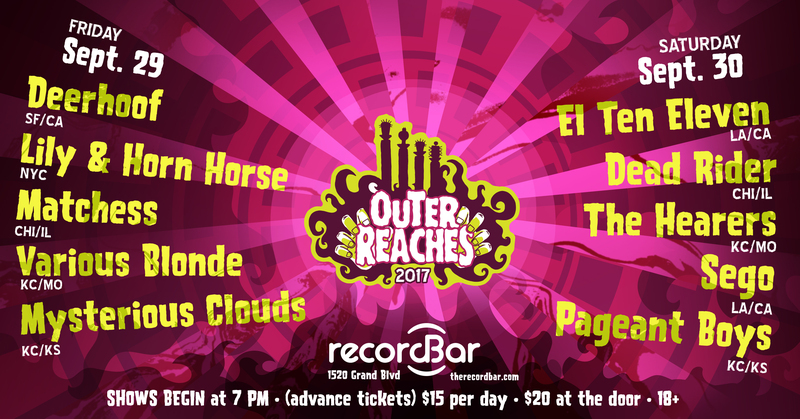 The music of Outer Reaches 2018 will be showcased over two days on two stages at recordBar. The lineup includes touring acts Cave (Chicago, IL), Sound of Ceres (Brooklyn, NY), J Fernandez (Chicago, IL), Death Bells (Sydney, Australia), Heaven’s Gateway Drugs (Fort Wayne, IN), Black Givre (Montréal, Québec), and Kee Avil (Montréal, Québec). 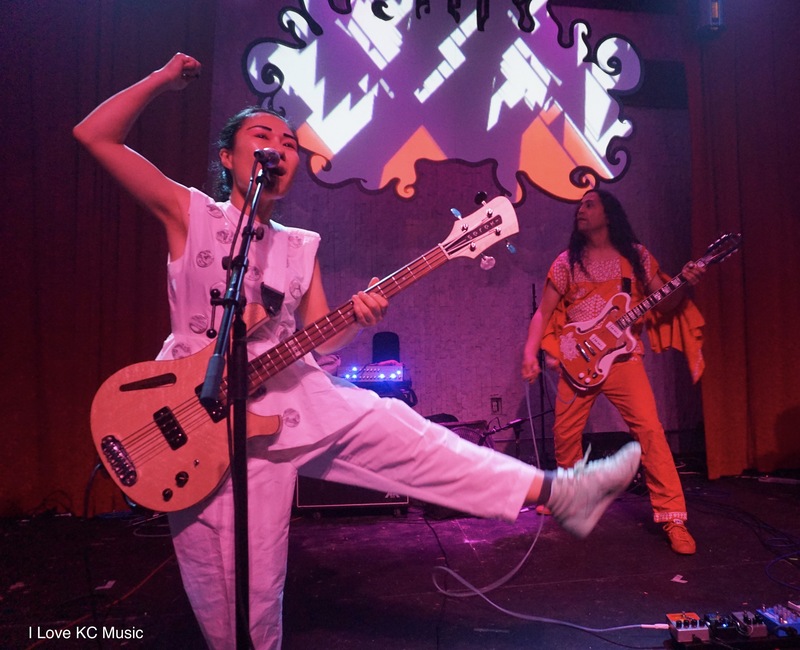 Kansas City and Lawrence, Kansas bands featured at the festival this year include Freight Train Rabbit Killer, Mysterious Clouds, Abandoned Bells, Jorge Arana Trio, Lesser Pleasures, JC & the Nuns, The Guillotine Choir, New Obsessions, and Lava Dreams. Both days will have accompanying live video projection provided by XO Blackwater. Additional artists, schedule times, and additional information will be announced at a later date. Outer Reaches is a music festival based in Kansas City that showcases the ‘out there’, left-of-center, under-the-radar artists experimenting within and pushing boundaries in their respective genre. Regional acts as well as national and international touring acts are a part of the festival’s spirit, celebrating the variety of experimental music around the globe. There has always a strong tie to music that would fit into the realm of psychedelic music, but the festival has since opened up to more genres with a goal of promoting all music that is adventurous and mind expanding. 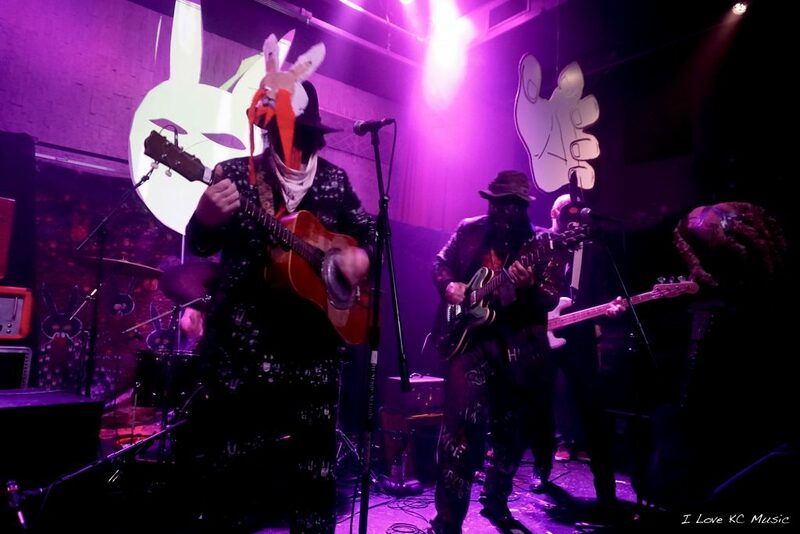 The festival began in 2012 at FOKL Center, a community art space in downtown Kansas City, Kansas and was organized by Dedric Moore of local psych / experimental bands Monta At Odds and Mysterious Clouds. Adding Haymaker Records owner Brenton Cook and recordBar owner Steve Tulipana to the Outer Reaches crew, the trio have sought to grow and change the festival each and every year. This will be the first year that the festival falls the weekend before Halloween. Outer Reaches 2018 is a partnership between the festival and Midwest Music Foundation and has been made possible through a grant from the Kansas City Neighborhood Tourist Development Fund. Midwest Music Foundation (MMF), a nonprofit organization founded in 2008, provides health care assistance, education, and resources to the Kansas City music community, and receive proceeds from ticket sales from the event. Outer Reaches is happy to be an official Expanded Field Partner of Open Spaces KC, a contemporary art experience with visual creations and performances by local, national and international artists transforming the city for 9 weeks. Sponsors for this year’s fest include KKFI 90.1 FM, Records with Merritt, 7th Heaven, KTBG 90.9FM The Bridge, Bullseye Records, Boulevard Brewing Company, Lagunitas Brewing Company, XO Blackwater, Josey Records, It’s a Beautiful Day, Seen Merch, Haymaker Records, Kosmic City, and Print Time. For more information on the festival, visit www.outerreachesfest.com. Each day of the festival is 18+. Friday has a ticket price of $15 (Day of Show), $12 (Advance) while Saturday has a ticket price of $20 (Day of Show), $15 (Advance). Advanced Two-Day tickets can be purchased for $25. All ticket options are available from the recordBar website. Please review the facebook events for Friday and Saturday. This year’s fest was amazing! See Photos of Day 1 and Day 2 of Outer Reaches 2017.